club little house: a new little house! I've had an idea that had been on the back burner since I participated in CLH December 2008 and finally I am acting on it. The idea is to create a dollhouse environment combining my little drawings along with miniatures, then photograph the scenes to develop a picture storybook. And if all goes as planned some stop motion animation too! I have no idea how this will turn out but I am excited to have a project that will be purely experimental and just for me. 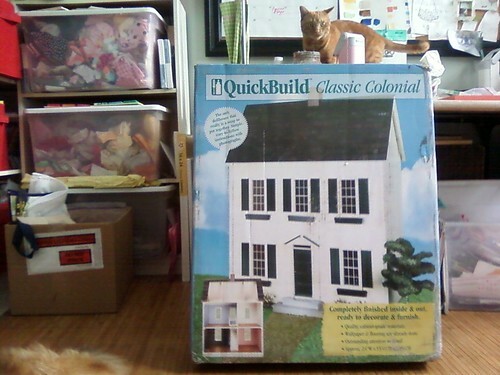 I searched for dollhouses on Craigslist hoping to find a used one. But there wasn't anything that fit what I had in mind. I'm still on the lookout for old dollhouse furniture that is 1/12 scale, so if you have some you don't want let me know! This weekend I put it together and blogged about it here! I really hope we'll be able to do Club Little House again one day. It was so much fun and now I have so many ideas! Congrats on your new little house! I was so excited when I saw that someone had posted on CLH!! My swap with CLH is what started it all for me with miniatures. I can't wait to see how you work your magic on this sweet little house! Have fun! Look at everything CLH has started! LOL!!! I am so excited to be playing with my idea finally! You have an amazing blog, it is really very awesome, if you’re interested here is the link to my blog of poetry, it would be awesome if you could check it out and follow if you like. Rather cool place you've got here. Thanx for it. I like such topics and anything that is connected to this matter. I would like to read more soon. cute, I didn't know home depot had cute things like this!!!! to answer you ?, she got it at a little resteraunt called Bravo Cheese factory. Fabulous!!! I will have to check it out! Cool post. Waiting for you to continue the topic. Cheap and trendy deisgner clothing from http://www.ronkaclothing.com where we sell: Lindsey Thornburg Cloaks, Alex and Ani, Maison Martin Margiela, Laundry, Vera Wang Lavender Label, Faviana, American Retro, Pillows, Aidan Mattox, Cheryl, JNBY, David Lerner, Love Quotes - all available from our online designer clothing store at 50% off sale! Cheap and trendy deisgner clothing from http://www.ronkaclothing.com where we sell: Scarves Wraps, A.L.C., Ports 1961, Oonagh by Nanette Lepore, Kimberly Taylor, Garter, Alana Java Satchel Handbag by Nicole Miller, Elbow Length, Diane von Furstenberg, Flat Boots, Sauce, Pants, MINKPINK - all available from our online designer clothing store at 50% off sale! How awesome! Your drawings are amazing! What a cool idea! I will be giving away two different cloth diapers soon, too! This is incredibly a good idea and should work better than the animations actually done with help of software. This is an actual talented job which if done in better way can be awesome. Best of luck.